The rabble rousers at the World Wildlife Fund (they re-named fake wrestling!) 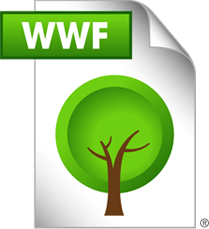 have created a new, PDF-type file format called WWF. It's a file format that CANNOT be printed out. The idea: save as WWF, save a tree.